Oh, I do love me a squabble. This objection, for you students of argumentation, confronts an argument from authority. You can argue from authority (though it’s usually a weak argument and should be heavily caveated as such), but if you are going to go the argument-from-authority route, you’d better make sure your argument pertains to the area of authority you actually have. So I’m not sure what field “afterlife studies” belongs to, but it’s safe to say that Beauregard’s publishing and grant record do not attest to his authority in whatever field that would be. Oho, Beauregard, let me set you straight the way I would have set Newton straight had I been there to drive from his back seat. Unfortunately, even without Dr. Myers to supervise him, Newton could pretty much kick all of our asses, even somebody as renowned as an associate professor at the University of Minnesota, no matter how much time Newton spent skylarking about alchemy, and no matter how silly he looks in that powdered wig he’s got on in all his portraits. His contributions to mathematics alone leave most scholars throughout history in the dust. So Newton “wasted” his later years? For reals? He should have done what with his last years, exactly? Newtonian physics (without which there is no modern physics) and helping invent calculus aren’t enough? Geez, tough crowd. What if he had taken up golf or stamp collecting or politics, instead of studying mysticism? Would those have been less of a “waste”? One reason we KNOW alchemy isn’t really worth spending time on is that people…smart people like Newton…spent time on researching it. Negative results are still results, people. As catastrophic as global warming is likely to be, there’s a part of me that rather enjoys watching scientists wiggle in outrage as people treat them and their claims to knowledge like so much noise–the way many, many scientists treat everybody who is Not Scientist–instead of the constant deference to them and their topics that many of them believe they are owed. There are plenty of humble, wonderful scientists out there who deeply respect the arts and humanities and the human endeavor more generally. My own university president, an electrical engineer by training, is fanatical about the arts and humanities–one of the (multiple) reasons I respect him a great deal. But for every one of those scientists, I swear there is a Mike Brotherton*/Dr. 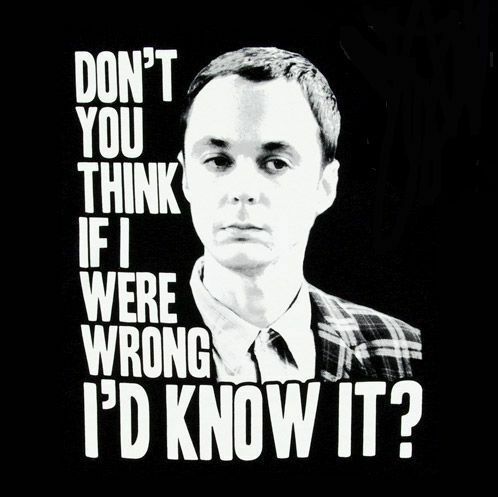 Sheldon Cooper who acts like any study of “not-science” is, simply, a waste of everybody’s time–and then wonders, after acting like kings astride the earth and showing no interest in listening to anybody Not Science, why for people no listen to them no more? Welcome to the fuzzy wuzzy world of human society, boys, where all of us actually live. Your playground got a lot less fun when, after you excluded and ignored people for years, the excluded suddenly stopped caring about what you think and built a playground/status hierarchy of their own where Experts in Science simply do not matter all that much. The rest of us would like to live a world where we can pursue many approaches to understanding and interpreting the world, and where we could work together to face potential problems like climate change, but that doesn’t seem likely any time soon. *BTW, I am a big fan of Mike Brotherton’s books and his blog, but if there is a way he can build in snark about humanities, he does. It’s tiring, and he’s also wrong.